The minister, however admitted that the medical college project was delayed due to dispute over selection of the venue for the proposed medical college. Though it was initially planned to set up the medical college at Rourkela, later it had decided to change the venue to the state capital. However, the minister said the ESIC has decided to upgrade its 50 beded existing hospital at Rourkela to a high-tech hospital with 100 beds. “We have planned to invest Rs 100 crore for upgradation of the hos ..
ROURKELA: Locals under the banner of Joint Action Committee for ESI ( Employees’ State Insurance) Medical College and Hospital staged a demonstration in front of ESI office at Vedvyas here on Tuesday. They also locked the office by emptying it. They were protesting clearance from Union ministry of labour and employment for setting up proposed ESI medical college and hospital in Bhubaneswar instead of Rourkela. The state government has received a letter from Centre in this regard. The protesters also threatened to launch an indefinite agitation after submitting memoranda to both Central and state governments in this regard on Wednesday. “We are deeply hurt by the development,” said senior advocate and chairman of the committee M D Parija. “At a recent meeting, we had decided to fight tooth and nail over the issue since Rourkela deserves the project with number of prospective insured persons being highest in Rourkela and its periphery,” Parija argued. Senior Congress leader and Sundargarh MP Hemananda Biswal also expressed his displeasure over the incident. He has been advocating in favour of Rourkela for the project. “Several organizations, including the committee members, have contacted me in last couple of days and expressed their resentment over the decision,” Biswal said. “Since, I believe that the decision has been an unfair one, a delegation from the district, representing cross section of the public under my leadership, will soon meet Prime Minister Manmohan Singh and ventilate its claim,” Biswal added. A parliamentary standing committee on labour and employment, headed by Biswal, had given its recommendation in favour of Rourkela for setting up the medical college and hospital. 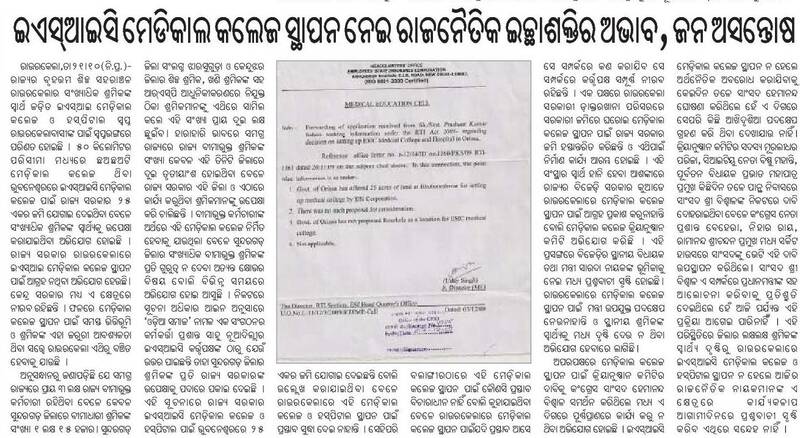 It seems finally Chief Secretary Tarun Kanti Mishra has come to the rescue of thousands of citizens demand for a medical college at Rourkela. He has taken up the issue with the Secretary of the Union Ministry of Steel. Residents of the steel town have been demanding an ESIC (Employees’ State Insurance Corporation) Medical College for more than two years. However, the ESIC has decided to set up its medical college in Bhubaneswar as the State Government offered land on the outskirts of the capital city. The people of Rourkela in general and intelligentsia in particular took up the issue at various forums. Political personalities cutting across party lines also demanded an ESIC medical college at Rourkela. But the demand was overlooked and, as usual, the e-mail petitions in this regard were coolly ignored. While the Steel Authority of India Limited (SAIL) has proposed to upgrade the Bokaro Steel Plants’ hospital to a medical college, a similar move is needed for Odisha, feels Chief Secretary Mishra. He discussed the matter with the Union Secretary of Steel in order to set up a medical college at Rourkela under the aegis of the Ispat General Hospital (IGH).